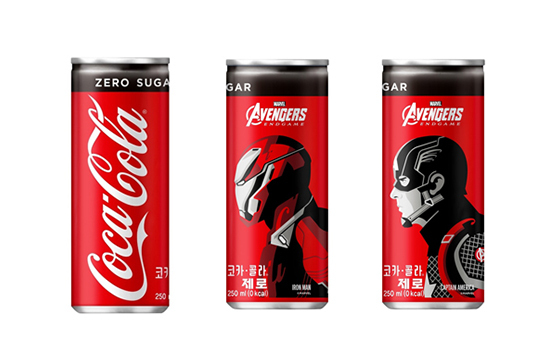 Coca-Cola Beverage Co., the Korean sales unit of Coca-Cola Company, will introduce a special edition featuring heroes and heroines of upcoming Hollywood blockbuster “Avengers: Endgame,” the company said Friday. The Avengers: Endgame edition, which will be available through its sugar-free Coca-Cola Zero, was designed in partnership with Marvel Studio’s Avengers: Endgame team, according to the company. The new release will come in options for bottles and can, all of which will be wrapped with images of 11 different movie characters including Iron Man and Captain America. Coca-Cola Beverage has been releasing a variety of special editions to appeal to more consumers in Korea. Early this year, it released special edition designed in collaboration with K-pop superstar BTS. The Avengers: Endgame is scheduled hit Korean cinemas on April 24. Prior to the opening, Robert Downey Jr. who plays Iron Man in the movie and Brie Larson, the Captain Marvel, will visit Korea this coming Saturday to promote the new movie.